The latest trend hitting the wedding industry is alternative wedding cakes. Taking the most delicious foods and turning them into a tower of beauty, offering a real statement piece for your special day. We are saying goodbye to the fruit cake, marzipan and icing *weeps* and embracing cheese cakes, cup cakes and pie cakes. If you haven’t got a sweet tooth, why spend all that money on a sweet cake? Go for something a little more savoury. A popular choice for a savoury wedding cake is the Pork Pie Wedding Cake! Another popular choice is the Cake of Cheese. Not a Cheesecake, but layer upon layer of cheddar’s, brie’s, Stilton’s and goats cheese. If you are feeling especially naughty, why not mix the two together. Layer of pie followed by cheese, followed by a smaller pie, then cheese, keep going… YUM! We all have favourite chocolates or sweets, so why not make this the focus of your wedding cake? 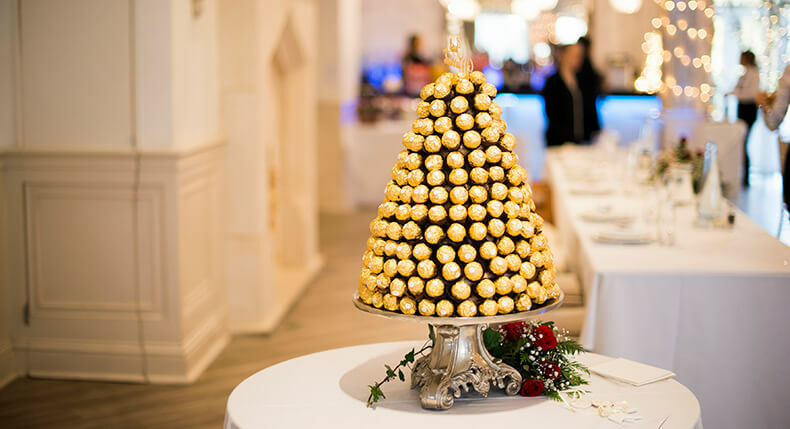 Here at Woodhall, we have seen some amazing creations including cakes made of Ferrero Rochers, Oreos, Thorntons and even one couple had a huge tower of Krispy Krème’s! Towers of chocolates and sweets can pretty much be made of anything and are so easy to create. You could even do it yourself, helping save budget. Simply bulk buy your absolute faves and get stacking… or maybe that can be a bridesmaid’s task? To save on cutting up the entire cake, why not have brownie slices or individual cookies for your guests? These can be easily stacked, creating a delicious stack of gooey goodness. Add some classic elegance with a tower of colourful and delicate Macaroon’s. These are great for incorporating your colour scheme into your cake, without the use of icing. Cupcakes are also very popular. They can be individually decorated to suit your wedding theme and guests can even take them away as favours. Why not create a theme? Personalise your cake to suit you and your other halves personality.  There may be a film or franchise that you both like, or you may both support a sports team. There have been some incredible creations on show at weddings this year, the most popular being either Star Wars or Harry Potter. 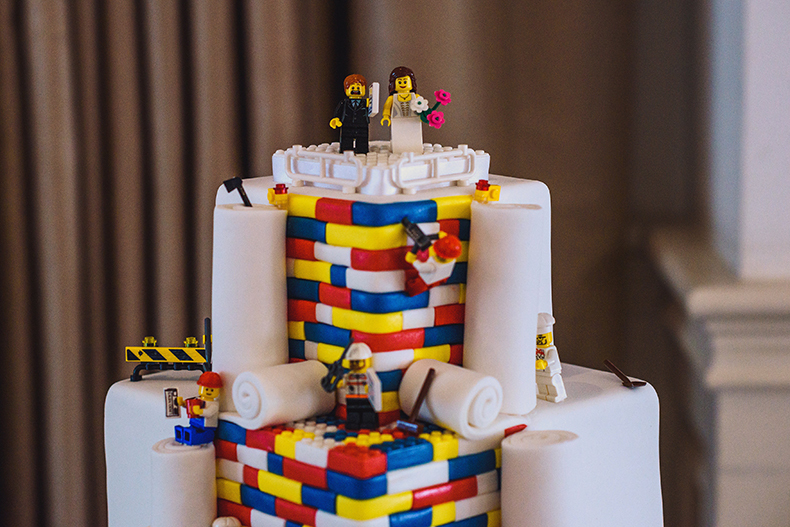 We personally love this Lego style wedding cake. So colourful and quirky! The best thing about this type of cake is that the opportunities are endless. As long as you find a cake decorator who is creative and imaginative, you can have any style of cake you wish. Just think outside the box. The naked wedding cake has been around for a few years, mainly because it suits the rustic wedding theme so well. 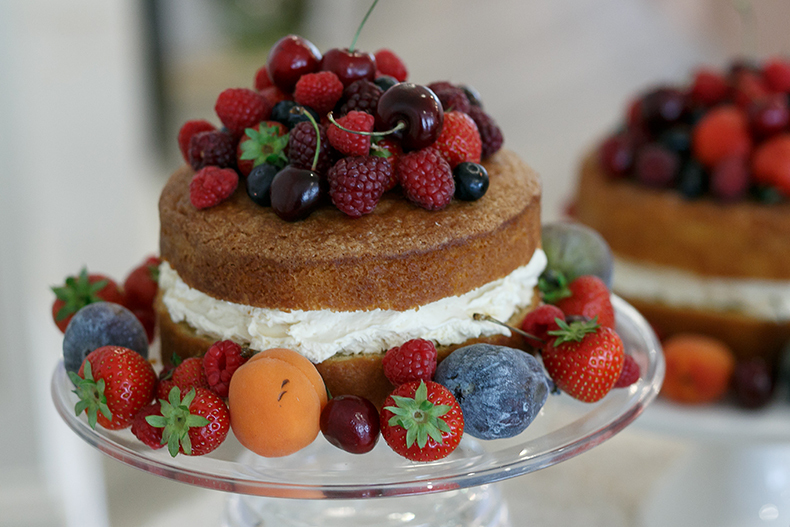 These style cakes allow you to have your favourite flavour sponge, sweetened with creamy butter icing and decorated with fruit, herbs and flowers. They can be as simple or as elaborate as you like, with as many tiers as you wish. Traditionally used in French weddings, the Croque en Bouche is mastered out of balls of choux pastries, all individually filled with crème patisserie. They are dipped in caramelised sugar and delicately stacked into a tower. The beauty of a Croque en Bouche is that they are so naturally impressive, they don’t need much additional décor. A simple wisp of spun sugar, or glistening icing powder is all it requires. There are so many ideas for wedding cakes available, making them fun, exciting and so imaginative. Give our team a call on 01394 411 288 or email info@woodhallmanor.com for creative inspiration or to discuss plans for your wedding day.